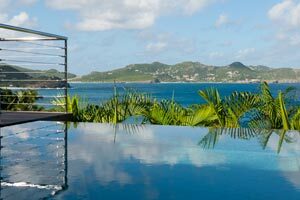 Perched above the Christopher Hotel, in Pointe Milou, St Barts, Villa UJV 324 is a 2 bedroom, 2 bathroom villa with pool. It offers a beautiful view over St. Jean Bay, St. Martin, and the surrounding islands. This villa is modern and comfortable, with a living room that opens completely onto the terrace and pool. Large, comfortable, off-white sofas invite guests to relax and admire the view or to watch spectacular sunsets. The living room shares the same area with the well-equipped kitchen and dining room. The 2 equal bedrooms offer similar amenities and each opens onto a private terrace overlooking the water. Bedroom 1 is located next to the living area, while bedroom 2 is located downstairs. A small terrace surrounds the pool and offers deck chairs for sunbathing. Located in the residential area of Pointe Milou - Carenage, this villa is suitable for friends traveling together.